So a few days ago, I got a text from Sara saying that she noticed I had holiday Jello something on the calendar and was wondering if I was FINALLY posting my soon-to-be-world-famous Jello/cottage cheese/shredded carrot concoction. I texted her back that I was. And then I couldn’t stand myself any longer because if there’s one thing I never joke about, it’s cottage cheese and vegetables in my Jello and told her I was planning on doing this. Yeah, funny thing, she had taken pictures of the exact same recipe last summer and had never gotten around to it. This is because in spite of the fact that we live thousands of miles from each other, we kind of share a brain. So really, this recipe is from both of us. I’m actually not a huge Jello fan–I really don’t like the texture and the only times I remember liking straight-up Jello was 1) at Skippers Seafood and Chowder House (has anyone else eaten there? Like…ever? I don’t think I’ve been since I was about 6!) where my mom and I would often dine when I was a kid and 2) after my first c-section when I hadn’t eaten in, like, 36 hours and I was pretty sure that red Jello was the best thing I’d ever tasted. So it is saying a lot when I tell you I thoroughly enjoy this Jello. Because it is awesome. And your kids will think you’re a rockstar. And grown-ups will start acting like kids (in a silly, Phil Dunphy kind of way and not in an obnoxious Michael Scott kind of way). We had this all the time at birthdays and holiday parties when I was a kid, but I hadn’t seen it in years and then I recently stumbled across my childhood recipe on the lovely Food Librarian’s blog (she has some awesome Jello ideas on her blog if you feel so inclined to peruse!) I was so excited, and so blasted from the past, that I had to make it ASAP. but you can adapt it for any holiday–red and green for Christmas purists, white and red for Valentine’s Day, green for St. Patrick’s Day, red, white, and blue for the 4th of July, the list goes on and on. This recipe isn’t hard at all, but it does require a lot of time and planning ahead–to make sure things go ideally, plan on at least 16 hours to make this, just to make sure everything sets up properly. Clear out an entire shelf of your fridge. Take 4 small plastic food storage containers; you can use any shape and you can even mix and match. Spray them with non-stick cooking spray and set aside. Bring about 5 cups of water (no need to measure right now) to a boil. When it has come to a boil, measure out 1 cup of water. 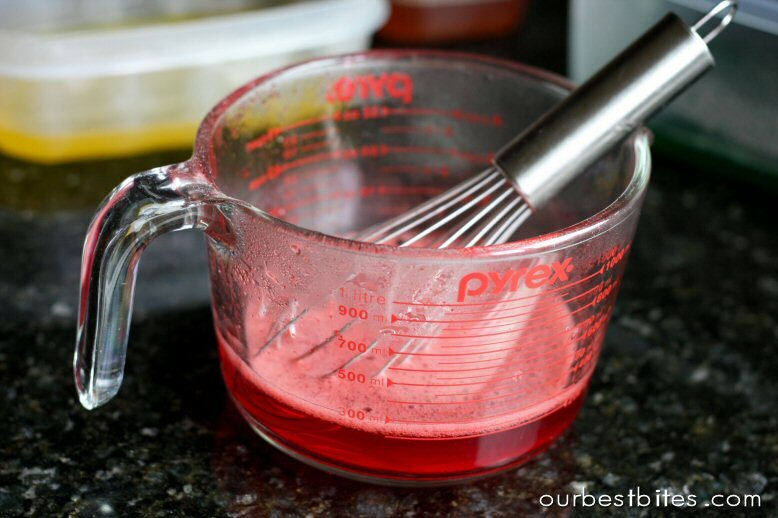 Whisk in 1 package of Jello and stir until it’s dissolved. and repeat with the remaining flavors of Jello and boiling water. Place these in the refrigerator (uncovered) for at least 4 hours, but overnight is really preferable. When the Jello has set up, you’ll need to prepare the white “filling.” Sprinkle 2 packets of unflavored gelatin over 1/2 c. of cold water. In the meantime, bring 1 1/2 c. water to a boil (you could totally do this in the microwave in a large glass measuring cup). When the gelatin has stood for 4-5 minutes, add the boiling water and stir to dissolve. and whisk the mixture until the milk is fully incorporated into the water/gelatin mixture. 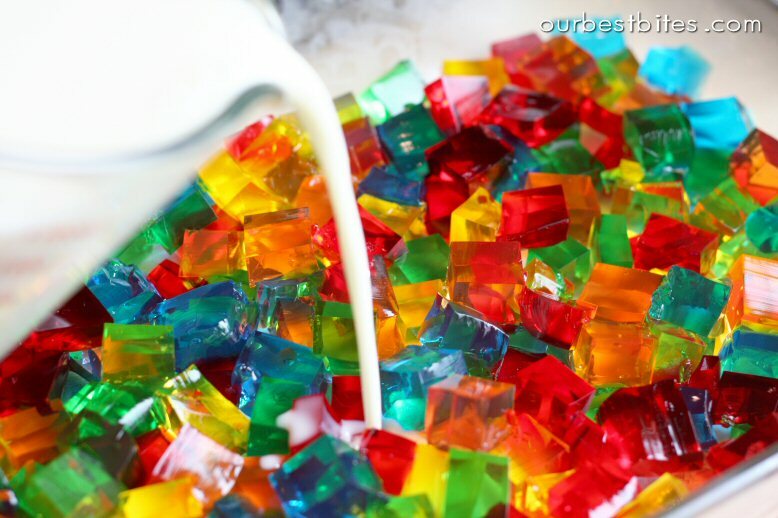 Allow the milk mixture to cool while you prepare the color cubes. 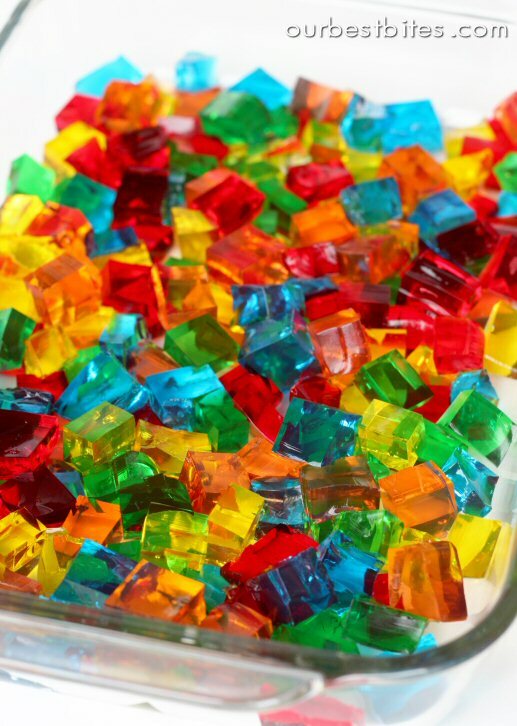 Remove the colored Jello from the fridge and carefully cut it into squares. When I say “carefully,” I mean to try and not have too many jagged edges, but don’t worry about making the squares perfect. Part of the beauty of this Jello is a little variation! Lightly spray a 9×13″ pan with non-stick cooking spray. Gently toss the cubes together in the pan. Um…isn’t that the coolest thing ever?? 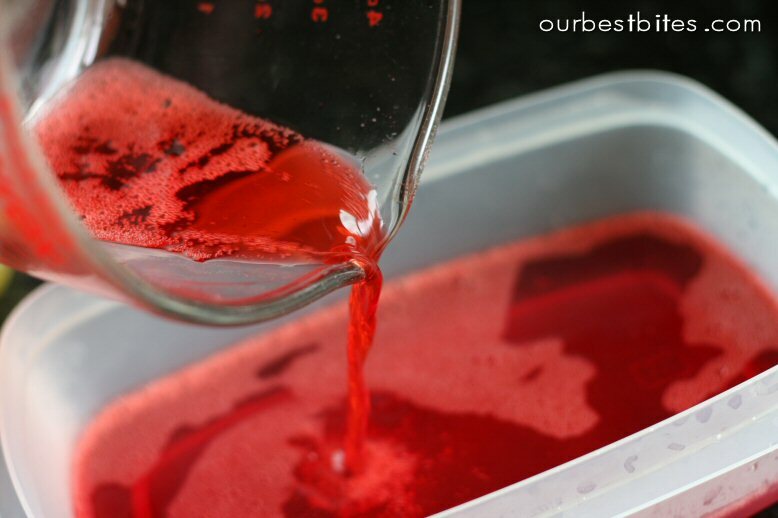 When the milk mixture has cooled (you don’t have to chill it; in fact, don’t do that–it just needs to be about room temperatures), carefully pour it over the Jello cubes. Some of the blocks will float to the top. You may need to rearrange things a little so you don’t have all of one color in one area of the pan and so the cubes are evenly distributed. Also, poke down some of the floaters so they’re not COMPLETELY protruding from the white mixture. Place the pan on a completely level surface in the fridge and refrigerate, (uncovered) overnight or at least 8 hours. or you could even use cookie cutters. Prepare yourself for lots of “oohs” and “aahs“! Spray 4 small food storage containers (like Tupperware/Gladware/Rubbermaid) with non-stick cooking spray. Set aside. Bring 5+ cups of water to a boil. Combine 1 c. boiling water with 1 package of Jello, stirring until dissolved. Place the dissolved Jello in one of the prepared containers. Repeat with the remaining packages of Jello. Refrigerate for at least 4 hours, preferable overnight. When the Jello has set, bring another 1 1/2 c. of water to a boil. While the water is heating, sprinkle 2 packets of unflavored gelatin over 1/2 c. of cold water. Allow to stand for about 4 minutes. When the water is boiling, pour 1 1/2 c. boiling water over the dissolved gelatin and stir to combine. Add the sweetened condensed milk and mix well. Allow to come to room temperature. Lightly spray a 9×13″ pan with non-stick cooking spray. 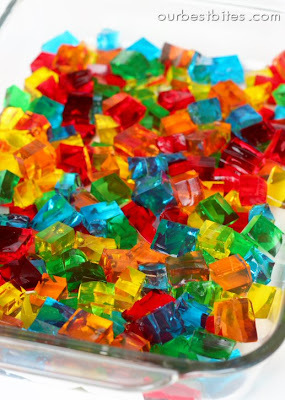 Carefully cut the colored Jello into cubes and gently toss to combine in the 9×13″ pan. 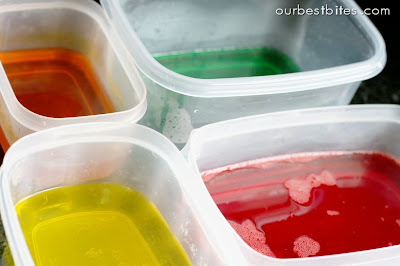 Pour the cooled milk mixture over the colored Jello and, if necessary, rearrange some of the colored Jello to make sure it is evenly distributed and not sticking out of the white mixture too far. Place the 9×13″ pan in the refrigerator and chill overnight. Cut into squares, rectangles, or various shapes with cookie cutters and serve. I've eaten at Skippers! They had the BEST clam chowder I've ever eaten. I'm from New England so I've had a lot of clam chowder! 🙂 I've never heard of this jello creation and I want to try it. wow so colourful and cute looking jello squares. I like Jello but only when the urge strikes me. But I remember seeing these squares at parties etc in the 70's and 80's and I thought they were so beautiful. I still do! LOL we used to eat at skipper's all the time when I was a kid!! OK, I am always impressed with this blog…everything here is amazing. But I just love the colors on these, so color me super impressed. They're beautiful, and I have a freaking billion boxes of jello this would be a perfect use for! Thanks!!!! Oh, also, you don't have to stir in any cold water when you mix the jello? ohhh how awesome would a classroom of children think I am with these?!?!?! I need to decide on what i'm going to make and stick with it. But you all keep changing my mind with all of these super cute recipes!!! I LOVE this idea! Can't wait to try it! What a beautiful thing! I will definately be making these for the kid's Christmas parties! Thank you! Thanks for the suggestion! My daughter is out of school until January 4 (darn year-round school!) and this would be a perfect activity to keep her busy. And it's just so darn pretty! do you all think if leaving in pan and then cutting as needed would be okay? I have a 13×9 pan that has a lid and came in an insulated carrier with a hot/cold pack. this way it would stay cold at school during the party? or do you have any suggestions in how to keep it cold, and not messy for serving purposes at a classroom party? question – do you have to do the condensed milk? my husband loves jello, but doesnt drink milk…. and if he thinks that there is anything RELATED to milk in it, he won't eat it, lol!!! could you do the unflavored gelatin alone, no condensed milk and make the bars clear? i mean i dont see why you couldnt do it that way, i just wondered if the condensed milk adds some special texture or flavor that can not be done without. thanks! We are lactose intolerant in my house so dairy milk regardless of its preparation is a no no in my house . I bet you could use coconut milk, or coconut cream. Coconut cream is pretty close to the same consistency as condensed milk and since you use coconut cream to make pina colada Id be willing to be that its plenty sweet enough. Its worth a try…i think maybe ill give it a shot and see what happens. Lizzie, will your husband eat imitation whipped topping ? In the 50’s and 60’s my mother made “Stained Glass” dessert with Jello cubes mixed with thawed, (previously frozen) whipped topping just before serving. It also was delish! The topping is carefully folded into the Jello cubes and served with a large spoon. Jen- that would be fine. Or really, for a classroom party it might be easier to have it cut into small squares on a serving tray all ready to be picked up by little fingers. That is, if there's a way to keep it cold until then. If not, sure, just leave it in the pan. Lizzie- it's sweetened condensed milk! Does your hubby know that's sooo different (taste wise) than a glass of milk? lol. Sorry, I just can't imagine a life without sweetened condensed milk! Plain gelatin is flavorless so I definitely wouldn't do that. I suppose you could just use regular jello in a fairly light color, but it definitely wouldn't be as pretty. You could also probably substitute a light colored fruit juice, but I can't guarantee the quantities are going to be right for the firmness you need because we've never played around with it. Jenn–Yep, I bet you could totally do that. The good thing about this Jello is that it is naturally stiff, so you don't have to worry quite so much about the massive potential Jello mess–the texture is more like Jello Jigglers. Lizzie–What if you replaced the sweetened condensed milk with pear juice or white grape juice concentrate? That way, you could still get some flavor without having the s.c. milk. oh wow! I think I just found my new holiday desert for gatherings! The kids (and grown ups) are going to love these this year. Thanks so much. amazing! These sound easier to make once you explained the process then what I first thought by looking at the first picture.I must try these. My kids will freak out! For those looking to substitute the sweetened condensed milk, I wonder if maybe coconut milk might be a good. It's sooo yummy! My kids would love this! How simple and what fun!! My 3 year old has discovered the wonders of jello and has been on a jello kick for the past two days so I may have to make some for him today. um… am I the only one that thinks they look like soap? Truth be told, I've always wanted to bite into those fancy bars. I think I'm going to like this dessert. 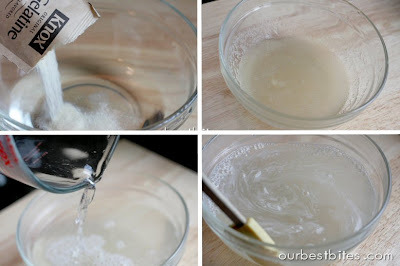 GREAT TIPS ON SUBSTITUTING THE SWEETENED CONDENSED MILK!!!!!! I AM GOING TO TRY IT BOTH WAYS, WHEN HE ISN'T HOME TO WITNESS IT LOL!!!! I completely agree they do look just like the specialty homemade soap bars out these days! I'll have to try these soon, I'm sure my 18 month old would love them. that is the craziest but fun thing I have ever seen. so cute. Happy Birthday Kate, both you and Sara inspire me everyday! How long will these keep in the fridge? Can you freeze them? 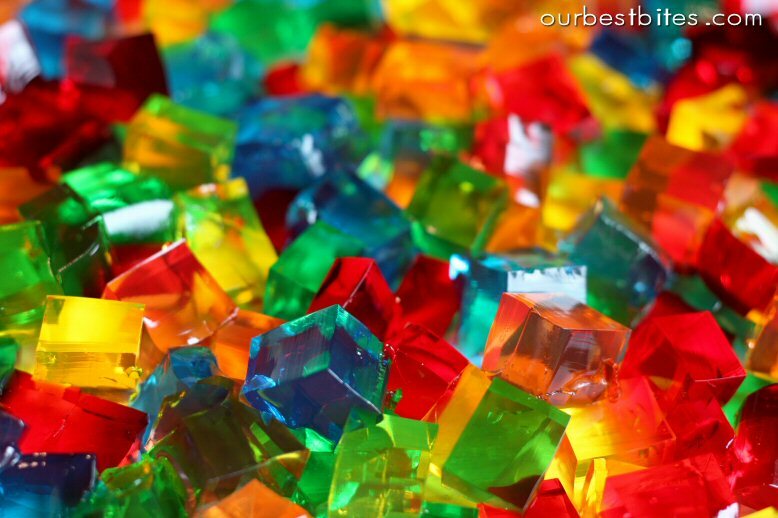 When I was a kid, one of eight, we ate a lot of Jello deserts! I even ordered The Joys of Jello cookbook through the mail, and made them all! I am going to make this for Christmas dinner, because we have two diabetics, and it can totally be adapted for that! Thanks! These are one of those COOL foods! I can't get over how beautiful they are! The colors remind me of Fruity Pebbles and they look like mosaics! I tried making Ribbon jello one time. Because of how much work it was and how it melted all over at the picnic, I said the was the first and last time I'd make that. This, however, looks much easier and prettier! Thanks for sharing! I've always wanted to make the rainbow layered jello my Mom made when I was a kid, but it takes all day to make because you have to wait for each layer to set before adding another. WOW she was patient! This recipe has the same effect, but much quicker! My kids will love it! And yes, when I saw this post at first, I thought it was fancy soap! I love this! I'm totally going to make these. So so cool. I just love your guys blog. You always are amazing me. This is cool! love this. need to make this for my boys, they will be thrilled! thanks. That is so freakin' cool! My kids will flip! Thanks! This is so cool and beautiful! I can't wait to make some for a family party or for my 3rd grade students. How fun! This is amazing! I'll be making it for Christmas. My kids will love it and I'm sure I will too. That looks way cool! I love it! It actually looks like those homemade glycerin soap bars!!! LOL I think my kids would love these! And oh yes, I remember Skippers, but I haven't eaten one let alone seen one in like 15-20 years?? This is two days in a row I have found your ideas most exquisite. Thank you for not being selfish and keeping these to yourself. Love it, love it, love it! And we have all this jello just sitting in our cabinets too! Gonna try this out! This is really a great idea that I have to try! Thanks for the great inspiration! Seriously, you AMAZE me with the things you come up with! Those are so beautiful!!! I have a ton of Jello in my cupboard, but for some reason, I never really make it. I should use some of it up in this recipe – how fun!! Oh so fun and pretty! I love pretty! I think we'll have them this weekend! What you need is for people to post pictures of there jello's from this receipe, reading everyone's comments my first thought was "I'd like to see how most of these readers jello's turn out". My mom made this for us as a kid all the time! She called it Rainbow jello and Haven't had it in years! My favorite part is the white jello! Thanks for letting me reminisce, It made me smile! when I first saw the picture before reading the text I was like, oh cool, but odd, that OBB is doing a thing about soap! This is much better. Literally. Who wants to eat soap? I had to once when I was 6 because I said a curse word. Not good. Do you think you could other non-milk substitutes? I can't use juice as we have two people who require tight carb counts, toss a milk allergy in there and we'll need to do something different, but I can't pass up this fun looking recipe. What do you think? I know I can't use soy as that won't even set in pudding…what about some sort of coconut milk? Any ideas? This looks fantastic for such a little effort! My kids are going to love this one. 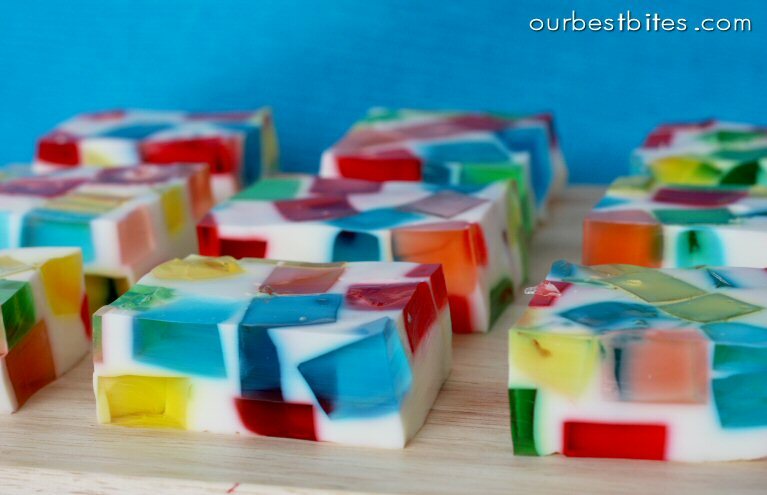 I am a jello fan, so these will be great to make for the kids. I remember the layered one my mom used to make, but this seems way easier. Thanks! K I read this yesterday and I seriously dreamt about making this…I'm off to the store for some jello. I am completely fascinated by these. I just keep staring at the screen… you ladies are amazing! One question- the first description says 1 1/2 cups of boiling water, but the actual recipe says 2 cups. Which is correct? What a fun, fun idea!! I can't wait to make these for my daughters class!!!! My dad would call this recipe "carpet pad Jello". I never really understood what he meant until I owned my own home and had the carpet replaced:-) I am totally making this for our church party this week! Thanks for the recipe. I love your site! WOW! This is an incredible recipe and I cannot wait to incorporate it into a dessert buffet menu. So, maybe I'm crazy, but it looks like you used five different flavors. Is there a chance we need more than four?? I can't wait to make these…awesome! Emily- some of the pictures are mine and some are Kate's. She used 4 colors in her batch and I used 5. It works with both, so if you'd like more feel free to add! I am so making this for our ward party next week! Thanks for the great idea! I made these today with my 3yo. We had a great time together, and the end result tasted good. However, we had the hardest time getting the jello out of the containers. We sprayed them with cooking spray, and I even dunked the pan with the finished result in hot water hoping to loosen it, but it didn't work. I couldn't get those suckers out for nothing so needless to say my squares weren't very pretty. How did you guys get yours to come out so nicely? Amber–That's seriously so weird! I just lightly sprayed the containers with cooking spray and they came right out. Did you use a new-ish can of cooking spray? Because sometimes when you get near the bottom of the can, it seems like you're spraying a lot because it's aerated, but really, there's not enough lubrication. That's the only thing I can really think of. I've already made this twice since your post. It was great tonight at the ward Christmas Party. Gone in no time 🙂 Thanks for all your great ideas. Thank you for posting this recipe! Had 3 different holiday parties this weekend and made a pan for each one! EVERYONE loved it! Beautiful presentation and soooo easy! Will this recipe work with Sugar Free Jello? My 10yr DD and I made this but instead of the milk we made Sprite (Lemonade)Jelly and it looked like stained glass windows at church. so pretty. We are making it for definite for Christmas. Our Christmas is sweltering hot summer here in Down under so Jelly is nice and cool for the kids. I've made jigglers with sugar free jello and they worked, but they tasted VERy tart, and not as good as regular jello. You could try making jigglers with sugar free jello first and see how you like the taste, then if you like it you could make it with the rest of the jello sugar free as well. I don't think you can get sugar free sweetened condensed milk though…? This was a Total Hit at a party that we went to last night. Adults and kids all loved it. Thanks!!!! made it for a party this past weekend and even people who don't really like jello ate it because of the way it looked. i LOVE your blog, girls, and your witty comments sprinkled in with fabulous ideas! merry christmas to you!! This is a great looking thing. I think it will really impress my in-laws when I take it round for christmas lunch. But I'm in New Zealand and I wonder what size your packets of gelatin are as I don't know if ours are the same? I made this for my daughter's class Christmas party and they turned out just like your pictures and delicious:) Thanks for the great ideas! Matt and Penny–Yep, you could totally do that! In fact, I almost did that last time except that I couldn't find the larger size. This is totally awesome. I just might make this for Christmas dinner with my family. The kids would love it! I just linked to this blog from mine- these are just amazing and I can't wait to see more! So I NEVER usually cook without a recipe, but I've been wanting to make this for Christmas and tonight I decided to get started, but I was too lazy to haul my computer into the kitchen and look up the recipe. So I mixed up the Jell-O according to the directions on the box, put it in un-sprayed plastic containers, popped the lids on, and put them in the fridge. It was only an hour later, as I was settling into an evening of watching the Twilight movies that I decided to look up the recipe, since I couldn't remember exactly how to do the white part. And that is when I discovered the error of my ways. Luckily I have a cupboard full of Jell-O, so I could start all over again, but geez, I felt dumb. And thus I've learned my lesson: When I'm trying a new dish, I shall never, ever, ever cook without the recipe. One, the jello cubes only needed about 3-4 hours to set up, after that I could cut them perfectly. Two, make sure the white mixture is not too warm, otherwise when you pour it over the color cubes it will cause them to melt just a little. I was able to make this all in one day. Despite a slight pinkish tinge to the white part, it was a huge hit and the kids and guests were amazed. you said you need to put it in the frig in open containers….my frig is hard to find a spot..does it not work if you put lids on and stack the containers? i think its so pretty it will be fun! Linda–The only concern with putting the lids on the containers is that there will be condensation and it may drip down onto your jello and make it not as pretty. But if you let it cool to room temperature before putting the lids on, the condensation will be minimal. Kate! So, I have been reading your blog for a year now after finding it through Karen Callister's blog. And only this month I realized that we were in the same freshman ward!! You are very popular, you know? Even in Japan!!! I live in Japan right now, and there are lots of ladies here that are in awe with your recipes. I bet this particular one will be my husband's favorite to make for kids (he is a pro at layered jello, so this will be a new thing to conquer-haha). Keep up the good work, and we'll keep on reading!! What brand of sweeten condensed milk did you use? I used bordens and it turned a slightly yellowish color… not white like yours! Just made this in red & green for our Christmas Eve party. They look so cool!!!! I had an idea for Sara and Kat. One of your followers Lizzie, her husband has an issue w/ milk, well being so involved w/ the hispanic community for the last 8 years, (thanks to my awesome husband Oscar & serving as a full time missionary), there are the hispanic jellos & 1 is Nuez (nut), it's the same color as what you are using and it's nice a sweet! LOVE IT! I have used it making jello cups for my kids' b-day parties in NC. Hope that helps someone! Just have to go to a hispanic store or food section to find it! Love you guys! I made this for our Christmas Eve party & it was a HUGE hit. I'm now making it again to take to another family party for Christmas day. I also made the bleu cheese stuffed potatoes for the second time & they were delicious. You guys have the greatest blog. I've been a fan for a long time but I never comment. I'll be making this recipe for every holiday. The color possibilities are so much fun! Thanks!!! I love this! I love the way Jello looks. I have made some of the layered ones in bundt pans. They came out really nice but this is what I have to try next. My wife is from Mexico, and believe it or not Jello/Gelatina is very popular, probably more popular than here in the states, even in our Jello belt (Utah and Idaho) they have ones similar to this but the base is more beige in color so the colors don't pop as much as yours. Very striking! In some parts of Mexico it is more common to take a Gelatina to a birthday instead of a cake. I love your blog, some of my friends have convinced me to start my own check it out if you like, it is only a couple days old. Great stuff thanks for your contribution! OOh, I'm totally making this!! Kroger has their own brand of gelatin that comes in a big box w/ lots of those little pkgs. I just bought one yesterday! Hurray! just made this for new years and my kids loved it! fun and easy to make! thanks for the recipe! You have just so totally rocked my Jello loving world. I like the way Jello tastes, but I love all the wacky things you can mold it into. Feel free to check out my blog post relating to my traditional Thanksgiving 17 Layer Jello on my blog @ Thevocalsokool.blogspot.com. I Can't wait to make this for my next holiday party. I love seeing people go ape over Jello. Here is the specific post just in case you are interested. I'm not a huge jello fan, but my kids LOVE it… I'm sure this would be the hit of the week in my house… so fun! Can you use sugarless jello? I don't think it would matter but thought I'd check first. this looks amazing! wondering though- the recipe calls for 4 boxes but the photos look like you used 5. blue, green, yellow, orange and red. Can you use the same recipe with 5? I love jello so when I came across this recipe I knew I was in heaven. How have I never seen jello like this before?! I can’t wait to make this. Also, where do you guys get all of your recipes? Do you come up with them on your own? I have to tell you guys that I made this last Christmas with friends. I substituted as much vodka as possible in place of water (I did my research on the internet. Those college kids have really got it down to a science!). Not only were they beautiful, but they sure packed a punch!!! It was the festively perfect way to get everyone into the ‘spirit’! (haha…sorry, had to do it) Anyway, thanks ladies, for the inspiration! We made this recipe for Christmas in green and red, and it turned out wonderful. Tomorrow we are going to do all green for St. Patrick’s Day. Thanks! Has anyone tried it with coconut milk yet? I’m not adverse to using the sweetened condensed milk, but I DO love coconut!!! Maybe half of each? Thx for the fun recipe. I made it for my girls’ birthday party & everyone loved it. It didn’t turn out looking as good as yours though. All my color cubes floated to the top & the white gelatin sank to the bottom. LOL… It was a hit none-the-less though. Well, I hope you are proud of yourselves…I have been on the computer for a whole hour and didn’t even realize it!!! I am now going to be one of your biggest fans. Everything I see on here I love!!! Thank you so much for the wonderful pictures and instructions I cannot wait to try some of these things out !!!! Trying this for desert tonight. For some reason, I’ve got the pickiest kids on the planet. They never have been fans of jello. but maybe the cool way it looks (if it turns out right) will help. Started making this last night with my 8 yr. old daughter, she is so excited to have this for dessert tonight. She’s at school now and I was finishing up making it with the milk mixture(I guess I am too impatient) I didn’t let it cool long enough. My colors started to melt. For perfection next time, how long do you let it cool for? Thanks for the recipe! Alishia–Ooh, that’s tricky. I’d just wait until it’s about room temperature–it shouldn’t be setting up by then. Thanks for sharing!! you have a great blog! I subscribed via email! I made this with Easter colors for our Easter dinner and it was so fun and colorful on the table. I followed your directions exactly and it turned out just like the pictures. FUn, FUn!! –Thank You! Hello! I love your blog. My mom told me about it a month or two ago. I sat down to look at it and, knowing myself, gave myself 20 minutes because I knew I could very easily get sucked into a time warp aon a site like this. Anyway, I got to your site and after about 5 minutes determined that 20 minutes would not be enough so I went ahead and ordered a copy of your book for myself and another copy for my mom! I love it. Everything I have tried so far has been great. I would love it if you could mark on your recipe titles that they are in your book. I get on several times a week and sometimes I see something and wonder if I should print it out or if I already have it. I am sure it will only be a matter of time before I have memorized the index but for now I am going back and forth from the computer to my cookbook through the living room and across the kitchen. Just a suggestion! OMGs, I just stumbled onto this site… I love it! What a cute jello idea! Don’t you just love the internet???? Have you ever tried adding an vodka for an adult version? My good friend makes this recipe, she calls it Japanese jello. She makes it a bit different than the glass block window look. Instead, she freezes each layer one at a time. Between each layer she has the sweeten condensed milk. She alternates the jello with the scmilk. It turns out so pretty and the kids seem to love eating them. They don’t by any means look like the fancy homemade soap!LOL. 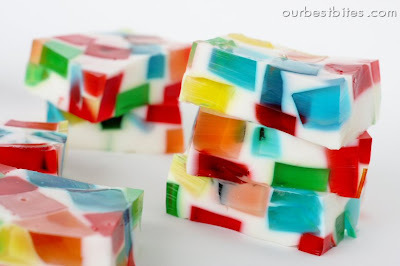 Looking at the Glass block Holiday Jello and it’s a have to make! BUT..what if my guess can’t have milk? Are there any subs? When I was a child, my 80 year old mother used to make Broken Glass Cake, with this very similar recipe, with the addition of pouring it over a graham cracker crust. Thanks for the reminder of a great childhood memory of telling people I ate “glass cake”! Made some for July 4th. Red, White and Blue! It was super easy and a huge hit! This is going to be a party favorite for every holiday. No one in my house likes Jello, they all pretend too though. But when they saw how pretty this was the kids couldnt wait to see it for real. It is sweltering so some cool Jello will be nice to have tomorrow. How bad can condensed milk Jello be? It reminds me of those candies that are white creamy soft goo with chewy gum drops- love them. I made this for a kid’s birthday party and it was a huge hit. Some of the Jello squares had a hard layer to them. I thinking it’s b/c I didn’t let the white milk mixture cool to room temp. I’ll make them again b/c they look really cool and everyone loved them! it says 4 flavors of jello. but you used 5. did you use all of the jello from the 5? i may never see the reply, with 135 already comments. but thought i’d ask anyways in case i should find it. I found your website looking for this multi-colored Jello creation, I’m a few months behind the times but oh well. I’m going to a luau this weekend and I needed something different. I’m a guy. I can be lazy, and am always looking for shortcuts for recipes. There is only one shortcut for your multi-color Jello. Ice Cube Trays. I made all the Jello squares using a plastic ice cube trays from the dollar store. I also made one other change in the recipe to zip up the flavor, but I’ll save that for another time. You are the only food website I have booked marked. Made it for my daughter’s 6th b’day party this past weekend. The theme was rapunzel so used all four rapunzel colore Jell-O. Was a hit! !Thanks for sharing the recipe! I made this for an 80s party and called them Rubik’s cube jello. They were a huge hit! I totally made this a million times, it wall called Broken Glass Dessert, and instead of sweetened condensed milk it was plain milk with pineapple jello in it, I’m sure this is thicker and richer. We also put it on a graham wafer crust, so there’s a variation for you. Will it be okay to add the sweet condensed milk without mixing it with the unflavored gelatin mix? Do you think the outcome would still be the same? I made this yesterday. It did come out slightly yellow instead of white though, and i used the same ingredients you showed in your picture. But it tasted great and i will definitely make it again!. What size containers do you use for the jello to set? Does it matter? 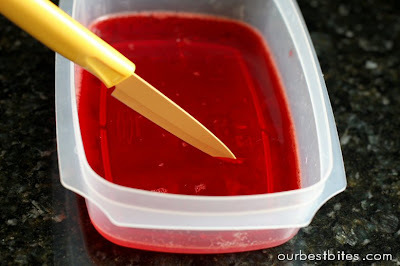 For example if we only use two colors of jello what size containers do you use, height, depth, & width? There’s really no set size, you’ll just have to eyeball it! Just imagine the size of little squares you want and go from there. Sounds yummy and looks fabulous!! This is awesome! I would like to make this for a party but want to make it beforehand. I think someone already asked but I couldn’t find an answer, how long do you all think it should keep in the refrig? a day or two is fine. I picked up this recipe here a couple of years ago (sorry I never commented!) It’s become a holiday staple at my house, where my nieces and nephews LOVE IT. Thank you for the great idea! We used to make this in Brasil for Christmas! I need make it again! Thank you! These look cool? Can’t wait to try the recipe. How much in quantity is 2 packets of gelatine? Here in Australia, our packaging quantities are often different. 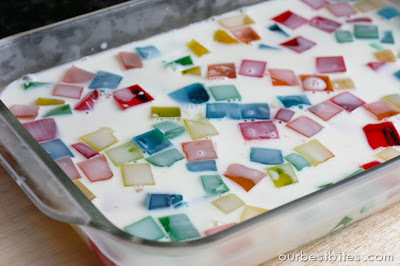 Hi, I’m wondering if its possible to pour a different colour of jello mix instead of condensed milk? My family hates condensed milk or milky products in general. Or perhaps there is another alternative to condensed milk. Where on earth was this when I was doing my daughters Rainbow Birthday party?! I’m going to have to try this for Christmas or Valentines day with matching colours. Thanks for sharing! Nós não conhecemos mas encontrei o seu blog hoje sem querer e descobri que você fala Português e gosta de culinária brasileira, então quero te passar minha receita preferida de Gelatina Colorida (que você chama de Glass Block Holiday Jello). 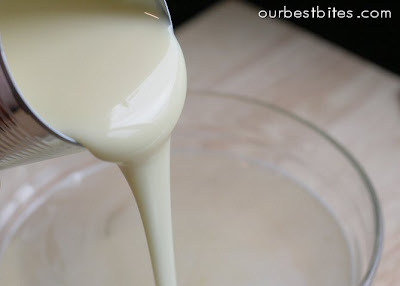 Acho que você vai gostar desse receita que usa creme de leite além do leite condensado e tem uma cor mais bonita de rosinha do que só branco. Prepare as 4 cx. de gelatina separadas de acordo com as instruções das embalagens. Corte em quadradinhos e reserve. Bater no liquidificador, o leite condensado, o creme de leite e a gelatina sabor morango dissolvida em 1 copo de água fria e 1 copo de água quente, por aproximadamente 5 minutos. Misturar este creme na gelatina colorida. Mexer e levar para gelar novamente. I know this is an old post, but I just had to comment anyway. I was told to bring jello for thanksgiving and remembered this recipe, but couldn’t remember where I saw it. So I did a quick search, found it, and got to work. Needless to say I was not on your site, and the directions were not clear. I searched again and saw that it was on your site. So much clearer! thanks for taking the time to always include all the little details!!!! I am giving this a try for a Christmas party I’m going this weekend! The recipe says 4 boxes but there are 5 colours in the picture… so I did 5 colours. Wish me luck! I just made these. I noticed the same thing that the recipe says 4 colors, but the picture shows 5. I made it with 5. And for some reason all of my squares were in the middle or top so there was a huge amount of white space at the bottom, and I was in a hurry and I think I cut them too soon they didn’t cut very nice. But they still looked ok. We will see how they end up with my son trying to take them on the bus to school for his party tomorrow. where did you find blue jello? So cool! At every family event they prepare boring jello molds, maybe I will shock them with this!!! Do you use sugar-free or regular jello? Looks sooo good. This was PERFECT for the Cub Scout Blue and Gold! My son was even able to help. Followed the directions to a T. Thanks! I would use orange, mango, pineapple, and melon fusion. The colors look like a orange/green spectrum. I too am lactose intolerant and before I found a lactaid diatiary supplement, I was able to eat all kinds yogurt without symptoms. That would maybe provide the “milky” look and you would have access to many flavors. I haven’t tried it …just a thought.